We’ve spent the last few weeks talking about lighthouses along the U.S. coasts – New England, Middle Atlantic, Southern and Gulf, West, and Great Lakes. While we talked about architecture features, we didn’t focus on the absolute most important part of a lighthouse. In fact, take this factor away and you’d just have a building, just a house. I’m talking about light. What produced the light and sent warning beams blazing into the darkness to warn or guide passing ships? That is today’s topic. In the earliest days of lighthouse keeping in America oil lamps or candles with reflectors cast strong and flickering light. 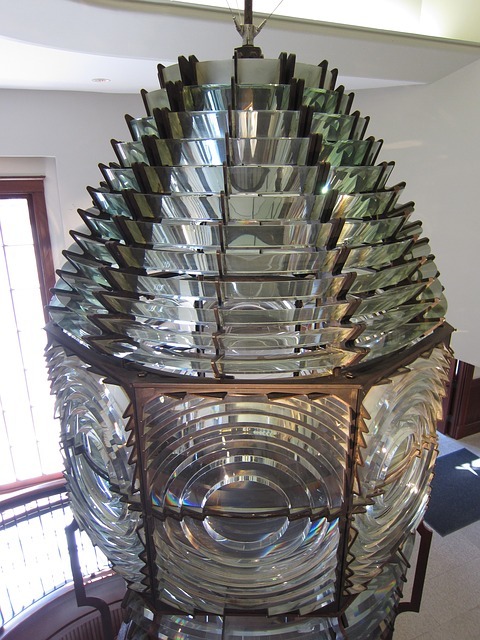 As the 19th Century progressed and the Fresnel Lens was introduced (see below), lamps with coiled wicks and oil reservoirs were regularly used. The types of oil used in American lightkeeping vary from decade to decade during the 1800’s. At first, whale oil was preferred, but as the price of whale oil increased, the search for a different illuminating oil began. During the 1860’s, the Board experimented with vegetable oil and then settled on lard oil. 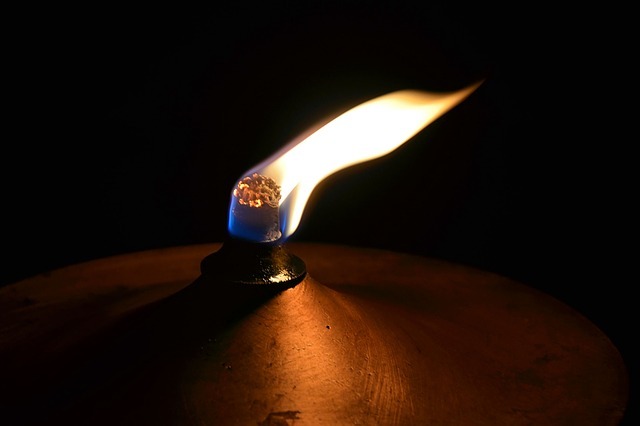 A few years later kerosene became the go-to lamp fuel and new lamps were designed to maximize its efficiency. Toward the end of the 19th Century, keepers and the Board experimented with natural gas and later electricity. During the 20th Century, aids to navigation were electrified and later automated. Designed by a French physicist name Augustin Jean Fresnel, the Fresnel Lens captured all the available light produced by the lamps inside, then amplified and projected that light using cuts and angles in the glass to send the light on a journey of many miles. It wasn’t until the Lighthouse Board took over the management of aids to navigation that the Fresnel Lens came into widespread use in the U.S., though it had been available and used for decades in Europe. How did lighthouses have a flash pattern? Large clockworks propelled the lens and a flash pattern could be predetermined. Fresnel Lenses come in different shapes and sizes, depending on the lighthouse size which is determined by the navigational need. There are “orders” of lighthouse lenses. The First Order are the largest and were placed in – you guessed it – the largest lighthouses. The numbers increased but the lens size decreased in the orders, so a Fifth Order Lens was significantly smaller than the first order. The smaller lenses were in the smaller lighthouses with the tiniest Fresnels reserved for harbor lighthouses which didn’t need to to send light beams over incredible distances. Crafted in France from specially cut glass, lenses were expensive and delicate. They were also the best technology in the world at the time for directing light. 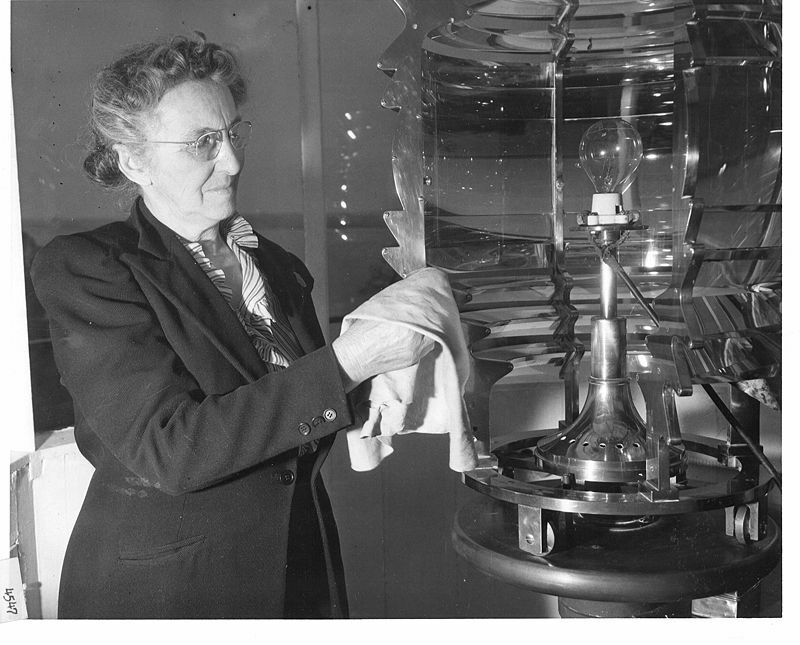 One of the lighthouse keeper and assistants’ duties was cleaning the Fresnel lens. And there were strict instructions for the process. Clean cotton cloths to wipe away any specks of dust or soot. No wedding rings or any other type of metal which could accidentally scratch the lens. The lenses had to be kept spotless and it was one area of lightkeeping that an inspector would be certain to check. The lamps also had to be kept clean and the oil reservoirs filled with oil, ready to be lit at any time in case of storm or at the usual evening time.